The U.S. Senate on Thursday dealt a historic rebuke to Saudi Arabia, a longtime U.S. ally, passing a resolution to end American support for the kingdom's military intervention in Yemen's civil war and another measure condemning the killing of a dissident Saudi journalist. After hours of passionate debate, the Republican-led chamber voted 56-41 to approve the first resolution. Moments later, it adopted the second resolution by a voice vote. In both cases, the chamber acted in defiance of the Trump administration, which has strenuously argued against a rupture of cooperation between Washington and Riyadh. 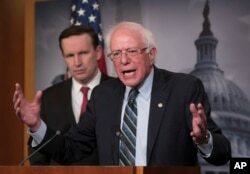 Sen. Bernie Sanders, I-Vt., joined at left by Sen. Chris Murphy, D-Conn., holds a news conference after the Senate passed a resolution he introduced that would pull assistance from the Saudi-led war in Yemen, a measure to rebuke Saudi Arabia after the killing of journalist Jamal Khashoggi, at the Capitol in Washington, Dec. 13, 2018. "Yemen is now experiencing the worst humanitarian disaster in the world," Vermont independent Sen. Bernie Sanders said. "The United States has been Saudi Arabia's partner in this horrific war. We have been providing the bombs that Saudi Arabia is using, refueling the planes that drop those bombs, and assisting with intelligence." "Eighty-five thousand kids [in Yemen] under the age of 5 have died from starvation and disease," Connecticut Democrat Chris Murphy said. "All the evidence points to the fact that the Saudis are using our bombs to deliberately target either civilians or civilian infrastructure." Seven Republicans joined a unified Democratic caucus in backing the initial Yemen-related resolution, which asserts Congress' constitutional duty to declare war and approve prolonged U.S. military engagements. The U.S. legislature has not authorized America's support role in Saudi Arabia's campaign to combat Iranian-backed Yemeni rebels, a conflict that has led to widespread civilian deaths. 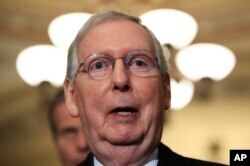 Senate Majority Leader Mitch McConnell, R-Ky., speaks to reporters on Capitol Hill in Washington, Dec. 11, 2018. "The United States is not involved in combat [in Yemen]. It is not dropping ordinance. It is no longer even providing air-to-air refueling [for Saudi warplanes]," Republican Majority Leader Mitch McConnell of Kentucky said. "If the Senate wants to pick a constitutional fight with the executive branch over war powers, I would advise my colleagues to pick a better case." "If we set the precedent that even an operation such as the refueling of aircraft of allied countries needs congressional authority, we would severely limit the executive branch's ability to respond to international crises and safeguard our global national security interests," Alaska Republican Dan Sullivan said. That argument did not sway resolution co-author Mike Lee, a Utah Republican, who countered that direct U.S. support for Saudi military actions constitutes unambiguous involvement in the war in Yemen. "We're involved in this conflict as co-belligerents [with Saudi Arabia]," Lee said. While the Senate resolution sends a strong signal of displeasure to Saudi Arabia, it is likely to stand as a largely symbolic gesture for now. Swift House action became less likely after the chamber advanced a rule blocking a vote on any war powers resolution relating to Yemen for the remainder of the current Congress. 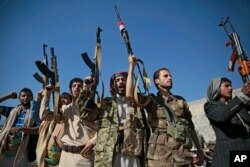 Tribesmen loyal to Houthi rebels hold up their weapons as they attend a gathering to show their support for the peace talks being held in Sweden, in Sanaa, Yemen, Dec. 13, 2018. "You look at the humanitarian crisis in Yemen today and it wasn't started by the Saudi air campaign," Illinois Republican Rep. Adam Kinzinger said. "It was started by the Houthi rebels and denial of access for food overthrowing the legitimate government." Congressional ire toward Saudi Arabia had been simmering for years as Yemen's civil war dragged on with ever-higher civilian death tolls. Anger spiked sharply after dissident Saudi journalist Jamal Khashoggi was killed at the kingdom's consulate in Turkey two months ago. The second resolution approved by the Senate blames Saudi Crown Prince Mohammed bin Salman for Khashoggi's death, expresses support for Yemeni peace talks, and states: "there is no statutory authorization for United States involvement in hostilities in the Yemen civil war." President Donald Trump has said that responsibility for Khashoggi's death remains an open question, and noted Riyadh's repeated denials that the kingdom's crown prince, Mohammed bin Salman, played a role. Speaking at the United Nations on Wednesday, Secretary of State Mike Pompeo said, "America's interests in the region are important … and we intend to continue to work with the Kingdom of Saudi Arabia to keep America safe." Trump's critics in the Senate slammed the White House's posture. "This administration is putting the Saudi government on a pedestal that stands above American values," New Jersey Democrat Bob Menendez said. "They continue to extend a blank check to certain players within the Saudi government, no matter how brazen their actions." 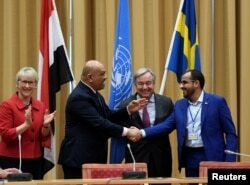 Head of Houthi delegation Mohammed Abdul-Salam (R) and Yemeni Foreign Minister Khaled al-Yaman (2 L) shake hands next to United Nations Secretary General Antonio Guterres and Swedish Foreign Minister Margot Wallstrom (L), during the Yemen peace talks in Sweden, Dec 13, 2018. The Senate voted as news emerged of progress in U.N.-sponsored Yemeni peace talks in Sweden, raising hopes that desperately needed humanitarian aid may reach the country. "The pressure of the international community and the United States Senate, making it clear we will not continue to participate in that war, is helping the peace process," Sanders said. Other senators drew a different conclusion. "We're actually actively pushing the players to the table to resolve this," Oklahoma Republican James Lankford said. "This is the worst possible moment for this body to start arguing about whose side we should be on." Senators of both parties signaled they intend to push for further sanctions against Saudi Arabia when the new Congress convenes in early January. "The current relationship with Saudi Arabia is not working for America," South Carolina Republican Lindsey Graham said. "To be an ally of America, more is expected of you, not less. I just want everybody in the [Middle East] region to know that if you're thinking about doing what MBS [Mohammed bin Salman] did and you want to have a relationship with the United States, good luck. It's not going to happen." "This [resolution] is just the beginning unless this administration and the Saudi regime make a decision to start acting differently in resetting the foundation of our relationship," Murphy said. Others urged that Saudi Arabia's actions be weighed against those of other powers in the Middle East. "Nobody in this debate seems to want to talk about Iran," Sullivan said. "If we cut off U.S. military assistance to Riyadh, you better believe that the one capital in the Middle East that will be cheering the loudest is Tehran. And our allies, including Israel, would feel less secure." Even so, there is bipartisan appetite on Capitol Hill for further action to punish Riyadh. "This is not going away," New Hampshire Democrat Jeanne Shaheen said. "This is something we are going to continue to work at, because people need to be held accountable for what's happened." Before passing the resolution, the Senate approved several amendments, including one prohibiting a resumption of U.S. refueling of Saudi warplanes for missions over Yemen.